Where do I use my ProForm Fitness voucher code? Browse NetVoucherCodes for the best offers and copy a code. Go to the ProForm website and start shopping. Go to your basket when you’re finished buying. Click on the ‘Do you have a voucher code?’ text and paste your code into the box that appears. You can then click ‘Apply to order’. Enter your address and click ‘proceed to next step’. Enter your email to download a free guide to help you choose the right treadmill for your needs. Sign up to the newsletter for news about new products and money saving deals. ProForm Fitness is the world's number 1 fitness brand, supplying top quality fitness equipment for use in the home. Shop here for treadmills, exercise bikes, elliptical machines, rowing machines, weight benches and more, all designed to give you the most effective workout possible. If you spend over £250, you can apply for interest-free finance and delivery is free, so there is no reason not to install some equipment and get started on your fitness regime straight away. If you exercise on one of the Tour de France Bikes from ProForm Fitness you will enjoy the real road feeling of automatic incline and decline that simulates any real terrain. This bike lets you race through the actual 2015 Tour de France from Utrecht, Netherlands right through to the iconic Champs Elysees in Paris. If you prefer, you can create your own stage anywhere in the world using the amazing iFit® technology. Race past the waiting crowds via Street View on the large 10-inch touchscreen that provided fantastic views as you cycle. Using a discount code from ProForm Fitness is a great way to save money on your purchase. The codes give you money of select products such as "Save £200 when you buy the ProForm Le Tour de France Cycle now for just £999" or money off a minimum spend like "£100 saving when you spend £1000 or more " or a general discount e.g. "10% discount on your order ". Using a code is simple, just enter it at the checkout stage to see an instant saving on your final payment. Always check here at NetVoucherCodes, before placing an order to see what discount vouchers and money saving offers are available at ProForm Fitness. At ProForm Fitness you'll discover a wide choice of Treadmills including advanced features like iFit and integrated audio systems to entertain you during workouts. Their top quality yet highly affordable treadmills are built to last and are the perfect choice for running, exercise and high-performance training. Choose from the Premier series, the performance series, the compact and powerful Sport Series, The Watts LED series with the easy to read round Watts LED Display or the Endurance series to increase your staying power. Standard delivery is free to most UK and Irish addresses. There are a small number of locations that will have a survharge for delivery. More information can be found here. Saturday delivery can be arranged in most locations for a £19 charge. Upstairs delivery is also available this is charged at £29. Am I able to get a replacement manual for my product? Yes you can download a manual to replace any lost or damaged user manuals. To access the user manual you will need to fill in the form here. What warranty do the fitness products come with? All products carry a 12 month warranty, if you register your product within 28 days of receipt then you can get a free extension to your warranty. 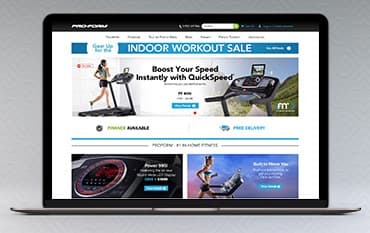 Pro-Form is the world's number one home fitness brand and a world leader in home treadmill drive systems, cushioning, interactive training and elliptical technology. With one of our ProForm Fitness Voucher Codes, you can make great savings on treadmills, ellipticals, fitness bikes, rowers, fitness trackers, weight benches and much more, all quality equipment at amazingly low prices. Don't worry if you don't have very much space in your home as ProForm has a range of compact and space-saving machines, suitable for the smaller living space.